Collagen is the most abundant protein in the human body, but as we age, the body’s production of collagen slows down. Less collagen in the body takes its toll on the skin in particular, as loss of skin elasticity leads to the formation of facial creases and sagging skin. Loss of collagen can also contribute to stiff, sore joints as we get older, when there is less collagen produced to support the tendons and ligaments of the body. Collagen’s essential benefit is in promoting health and healing from the inside out. Scientifically speaking, our collagen peptide amino acid profile is where skin quality is at. For example, the amino acid glycine found in collagen supports detoxification and metabolic functions. 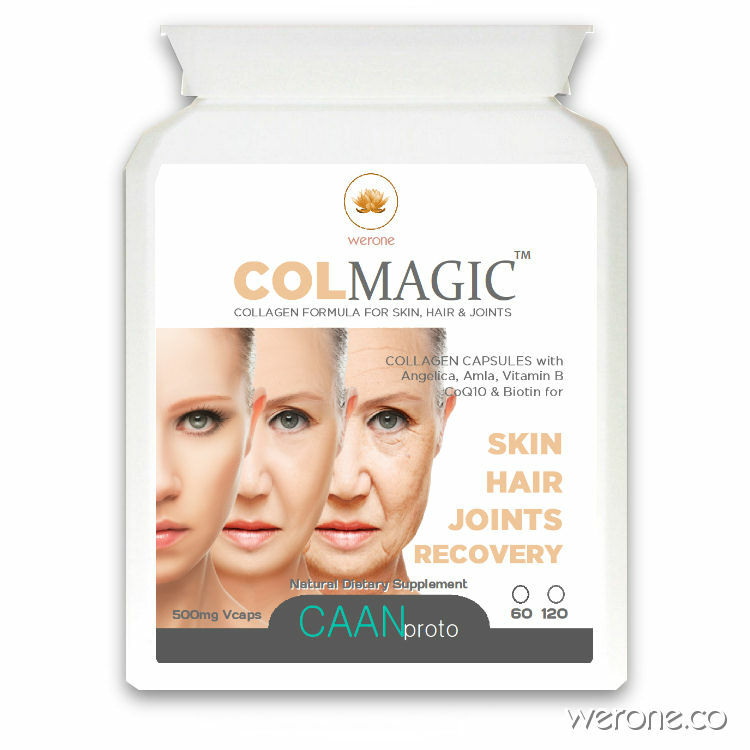 In short, COLMagic™ uses nature to fight the ageing process. COLMagic™ contains extra nutrients to help support healthy skin. Here are some of the other ingredients in COLMagic™ and their roles in the body. Indian gooseberry (AMLA) is high in Vit C, it helps with lustrous hair, glowing clear skin and good immunity and digestion. Angelica Invigorates blood circulation, nourishes the blood and invigorates circulation. Because of its association with healthy hair, skin and nails, this B vitamin also goes by ‘the beauty vitamin’. Oxidative stress can induce cell damage, CoQ10 helps to neutralize the harmful free radicals and oxidative stress which are some of the major causes of ageing. CoQ10 also helps the skin by acting as a strong antioxidant. Take 2 capsules 2 or 3 times a day with water or green tea. Taking electrolytes and minerals in a drink such as Electrobal+ provides other important cellular nutrients. Dietary tip: Avoid high sugar and grain diets, this causes inflammation and poor skin health. Here is a help page on how to reduce insulin levels.